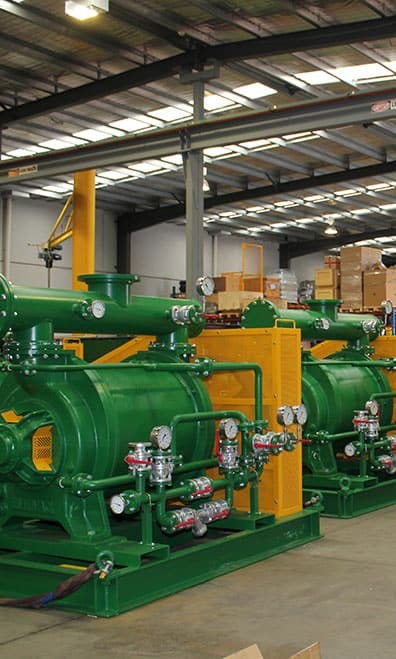 There are hundreds of applications for vacuum pumps in industries ranging from mining and manufacture to defence and aeronautics, to food and beverage production and water treatment. Whether a liquid ring or rotary vane vacuum pump or centrifugal process pumps are used depends on specific industry requirements. While the rotary vane vacuum pump may be the most popular mechanical type chosen for some industries other process industries may require custom solutions. Advances in technology and engineering have impacted on the types of vacuum pumps available and their uses. For example, vacuum pumps which were created for use in one industry, such as dry vacuum pumps, can now be modified and used in other areas. Emtivac is Australia’s leader in vacuum pump and system solutions and your first choice for professional advice on selection, application knowledge and expertise in design and operation for your industry. The following are examples of solutions we have provided for clients in various industries. 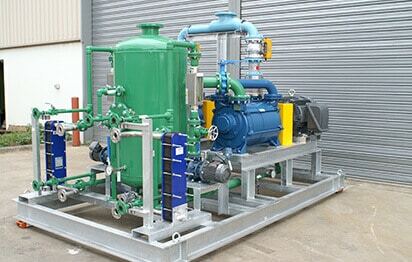 Our client asked us to help reduce the water consumption of four liquid ring vacuum pumps used for evisceration. Our solution was to design and manufacture a total service water recirculation system consisting of a new air water separator, circulating pump, duplex filters and plate heat exchangers for cooling from an existing chilled water supply. As a result water consumption was reduced by more than 95 per cent.Talk to today us about zero water use liquid ring vacuum pump options. Our client had a large duplex stainless steel acid evaporator liquid ring vacuum pump which suffered a broken impeller due to casting flaws. They were told a replacement spare part would cost them $75,000 and take eight months to deliver. Our solution was to fabricate and machine a replacement duplex stainless steel impeller. The total repair cost to our client was $38,000 and delivered in eight weeks. Vacuum pumps on our client’s 6m3 research vessel were taking 45 minutes to reach the required pressure, delaying their experiments. Our solution was to design,manufacture and install a 2000 m3/hr two stage system consisting of a roots style vacuum booster blower in series with rotary vane vacuum pumps. This was supplied complete with electrical control panel, suction filter and pipework. The result was an evacuation time to 0.02mbar in less than 2 minutes. Our client needed a way to safely clean up and recover spills of uranium oxide powder around their mill. Our solution was to design and manufacture a liquid ring vacuum pump based central system incorporating a collection pot and two stage wet scrubber system with automatic dump cycle and discharge air filtration. Our client set a production quota of 10,000 door trims per week for a new model car and urgently needed eight vacuum tables to meet production deadlines. Emtivac designed and manufactured the tables using 25 m3/hr DVP carbon rotary vane dry vacuum pumps, complete with electrical control panel. The tables were delivered in four weeks. This plant had a large number of small vacuum pumps which were inefficient and required high levels of maintenance. Our solution was to install three large oil sealed Emtivac systems which resulted in saving more than 100 kW in power consumption and greatly reduced maintenance costs. Our large capacity Emtivac N2BE vacuum pumps can use up to 30 per cent less power than your existing large liquid ring vacuum pump. Call us for a free energy use assessment. This client was pleasantly surprised to purchase a top quality Pompetravaini, Italian manufactured, 1600 m3/hr vacuum pump from Emtivac as an alternative to replace a worn German pump at a cost saving of $14,000. View the hundreds of typical applications for liquid ring vacuum pumps, listed in this document or contact us today to find out more about the industries and applications we have serviced. Ask how we can boost efficiency in your industry. Telephone (03) 9768 3240 or send an online enquiry today. Require maintenance or repair on your system?